The windmill on display at the Mennonite Heritage Village in Steinbach, Manitoba is the second replica of the windmill which was built in 1877. The original windmill cost $2,000 to build and was used to process feed, flour and for cutting lumber where it stood about 100 meters high. In 1879, another $1,300 was put into the windmill so it could be converted to steam and it was then moved to Rosenort. The original windmill was destroyed in 1920 with the first reproduction being redone in 1972, with that one being burnt in a criminal act of arson in 2000. The windmill on display today at the village was totally completed in September of 2001, not even a year after the fire and a ceremony was held on October 23rd where over 300 people gathered. Picture of the windmill and sign at the Mennonite Heritage Village in Steinbach, Manitoba. Before the path leading up to the windmill, there is an interpretive sign for visitors to the Mennonite Heritage Village. This sign tells the history of the windmill and how it was used in early years. When visiting the Mennonite Heritage Village in Steinbach, Manitoba, the windmill is one of the main attractions. The Mennonite way of life is reenacted here, starting from the 16th century to the present day with historical buildings open to the public to explore with signs explaining each piece of history. 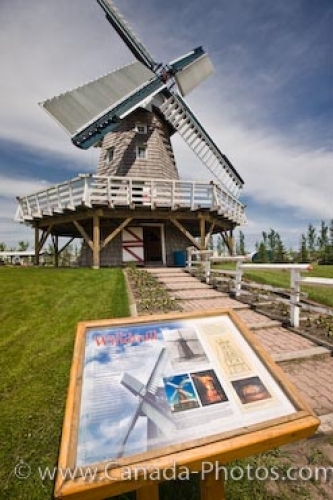 Windmill (built in 2001) and interpretive sign at the Mennonite Heritage Village, Steinbach, Manitoba, Canada.